I'm really getting old. Things bug me more than they ever have, and my wife has officially ordained me to be an old curmudgeon. I turned 65 earlier this year, so I guess the moniker applies, and is, in fact, an upgrade from what she used to call me. Still, some things that bugged me 33 years ago when I entered this business, still bug me today. This is made more frustrating by the fact that I've spent a lot of my later years trying to help people fix these things only to encounter them time and again in my travels around our industry. Here's one. Many years ago I realized that most salespeople in our industry are under-trained, under-lead, and under-coached, with the result that they under-perform and under-earn. Easily the most common complaint I hear from retailers is that they can't find “good people” for sales jobs. Often, salesperson attrition rates are so high that retailers find it difficult to maintain even current levels. In times of high employment, many prospective sales employees don't have to chance working in commission environments where compensation is uncertain. We talked a while longer and I learned that he was actually dreaming about earning that much money because he'd never earned more than $25,000, and $50,000 would make a huge difference in his life. Unfortunately there are some problems with this. No one had told him how he would get to the $50,000. No one pointed out that $50,000 was 5% of $1,000,000, or that the only person on the staff performing at that level had been working there for over 20 years, was a designer who made house calls, and had a very large customer base who were loyal to her. 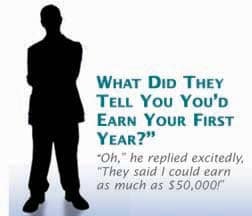 No one told him that the next closest person in sales delivered $750,000 last year and earned $37,500, which would still have been a great income improvement for this young man. No one had provided this new young salesperson with a clear pathway to his goal. In fact, no one had even talked about his goals for himself. He didn't know, as I did, that the store traffic and staffing levels would provide him with about 150 customers per month, or that the store average close ratio was 21%, and the average sale was $1,100, which would, in his case, mean that if he performed at the average level, he'd earn $20,790 - less than he earned at his old job where he was paid $12.00 per hour. But the $50,000 carrot got him hooked. On this sales staff of ten salespeople, six (60%) performed below the store average levels, earning less that $20,790. The store had a UP system that allowed all salespeople equal opportunities on door traffic, but the results varied dramatically as evidenced by the income levels. Even leaving out the designer person with 20 years in the store, sales volume ranged from a high of $37,500 ($750,000 sales), to the low of $18,400 ($368,000 sales) - all this with equal opportunities. Actually, a detailed audit of the sales metrics and traffic numbers showed that the lowest performer had the highest number of customer opportunities. In this store, this was just the way things were. Before the audit, the owner had no knowledge of these facts, and no plan in place to improve on this record of poor performance. The lost sales due to the variance in sales performance, was over $1 million per year. The thing that bugs me most is that I wonder which group of performers Adam will follow on the floor. Which habits will he adopt, those of the above average people, or those of the people performing below average? Here's another thing that bugs me. I think there are two basic types of customers who shop in retail furniture stores; those who are ready to buy and relatively easy to sell. I believe this group accounts for about 20-25% of the total number of shoppers. These people will buy when they see something they like at a price they can afford (usually on sale), that is available quickly, with free financing, and are served by a salesperson they like. I further believe that this is why our close ratios industry-wide are in the 20% range or lower. All our training has taught our salespeople how to deal with this 20-25% of total shoppers, leaving 75 -80% unsold and unsatisfied. This larger group needs all of the things the first group needs plus one more critical thing - more help. However, we haven't defined “more help”, and our training, therefore, can't deal with how to provide it. More help can mean many different things, but I believe that the lack of it means that this large group of shoppers continues to recycle through the marketplace until they either receive more help, or simply give up and settle for something, or withdraw from the marketplace. There is research that indicates that as many as four of ten furniture shoppers did not make the purchase in the same year they shopped. All of us see these customers all the time. They're the ones who won't talk to our salespeople, who act defensively when we try to engage them. They hate being “sold”, and want more help, but most salespeople don't know how to step up their game to provide it. When you only have one song to sing, some people won't like it. I think the reasons for this disparity are simple. Our business is about rooms, not about furniture, and for those customers who are uncertain about how their furniture purchase will work in their room, and their home, or how to put a room together without making costly, long-lasting mistakes, little help is available from most salespeople in our business. It's not their fault either. They simply do what we train them to do, and what we coach them to do. When these customers meet a great salesperson who deals with the room issues and tough design problems the customer is facing, or simply helps the customer better understand their own issues, they buy. These salespeople are among the best performers in our business, and their closing ratios are in the 30% range, or higher. So, there are two things that have bugged me for years. There are more, but you're probably bored now, if you've even read this far. In the future I'll try to suggest some solutions to these two industry-wide problems, and then I'll talk about some more things that bug me.